Baseball was brought back to Kalamazoo the summer of 2014 after 3 years of no baseball in Kalamazoo. The newest member of the Northwoods League unveiled their new team name at Homer Stryker Field on November 15, 2014 at the team's Opening Event. Over 750 names were submitted as potential new team names during the teams #NAMEYOURTEAM contest. The names were narrowed down to the final five of Cabbies, Clutch, Growlers, Kangaroos, and Kraken. After two weeks of voting and over 3,000 votes later, the Kalamazoo community had spoken. The Kalamazoo Growlers was the new team name. The Growler name is an homage to the rich history of microbreweries originating in Kalamazoo. A growler is a glass or ceramic jug used to transport draft beer frequently sold at craft breweries, microbreweries, and brewpubs. Growlers are a staple in breweries because of their ability to hold carbonation indefinitely, and for upwards of a week when first opened. They can also be refilled when empty. Most recently, Beer City USA ranked Kalamazoo as the #2 craft beer city in the country right behind Michigan's own Grand Rapids. The logo is also pays homage to the native Michigan black bear that can be heard "growling" in the woods of upper Michigan. The black bear (Ursus americanus) is the only species of bear found in Michigan. In Michigan, most black bears have black or extremely dark brown fur. Other color variations, including brown, cinnamon, grayish-blue and blonde, are found mostly in western North America. Average adult black bears stand less than three feet tall at the shoulder when on all fours and are approximately three to five feet in length. Males are typically larger than females. 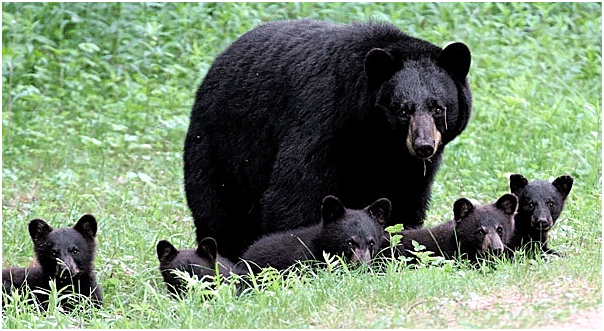 Adult female black bears weigh approximately 90 to 300 pounds, and adult males weigh about 130 to 500 pounds. Black bears are solitary animals, with the exception of females accompanied by cubs or yearlings and during the breeding season. The logo is also an attempt to capture the territorial nature of the black bear, as the Growlers bear defends the Kalamazoo skyline as if it were a bear cub. Growlers also tie back into the city's old Frontier League team, the Kalamazoo Kodiaks as well. The Kodiaks were the first baseball team in Kalamazoo since 1954, and called the city home from 1996-1998. It didn't take long for the franchise to realize the baseball fever in the city as the Kodiaks drew over 62,000 fans in their inaugural year.